Fitness trackers are the hot trend of 2013, with major brands like Fitbit, Nike and Jawbone all creating and then updating their respective activity trackers. The latest update comes from Jawbone, who’ve launched their UP 2013 model. Its been suggested that the average adult human should be taking as many as 10,000 steps every single day in order to live at optimum health. The majority of us have absolutely no idea how many steps we take, and it was from this position of complete ignorance that a billion dollar industry was born. In many ways the Jawbone UP 2013 is the very epitome of an activity tracker. Coloured wristband which you wear day and night? check. Companion smartphone app which collates and feeds back on the collected data? check. Steps taken and sleep patters analysed? check. Advice, goals and general motivation delivered through the app and via vibrations in the band? check as well. So what new stuff have Jawbone delivered for their 2013 upgrade? NB this model was released in 2012 in the USA and arrived here in the UK in March 2013. 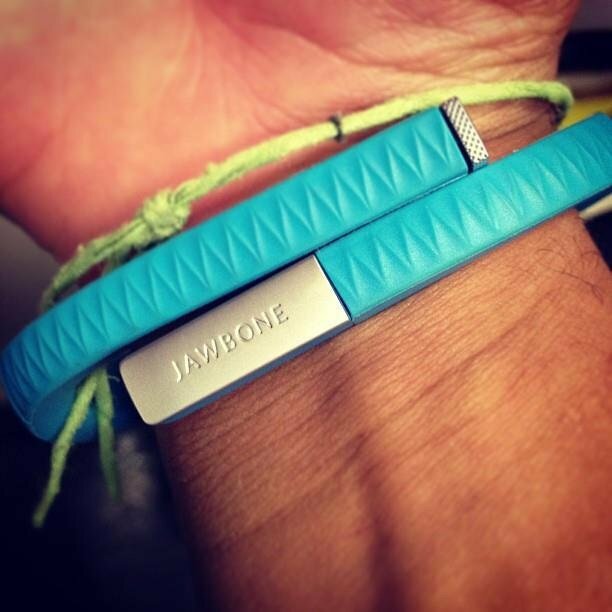 Design wise, the Jawbone UP 2013 is pretty much the same as its predecessor. Its a relatively anonymous piece of wearable fit tech, looking not dissimilar to a charity wristband, albeit with the inclusion of a silver tips on the end of the band. The rubber has a slightly higher quality feel compared to a charity wrist band, with the inclusion of a raised, slightly dimpled texture on the band itself. The silver tips serve a purpose, one end containing a socket to connect to your smartphone via the headphone socket, the other is a button to control the device with. Finally, the UP 2013 has a series of very discrete LED lights, which can shine in hues of red or green as a mechanism of displaying the bands current status, mode and any notifications. The UP is available in 8 colours, most of which are brights and interesting, which is totally in line with the current fitness technology trends. As tempting as the vibrant orange band may be, it is important to remember that activity trackers need to be worn 24/7 to deliver full value, and a bright orange band hidden under a suit may not wok great in the boardroom. Your choice though. The UP comes in 3 different sizes, and for the pedantic amongst you, you can get the perfect sized UP by using a piece of string and by visiting the official Jawbone website. Considering we’re only looking at 3 different sizes, this is probably surplus to requirements. I have exceptionally small wrists and therefore went with the small size, and that worked ok for me. Its better to get a fairly tight fit in my opinion, otherwise the band becomes more of a distraction. This is especially true for anybody who does a lot of typing – a loose band could become a real hinderance in this situation. The UP 2013 taps into the growing trend of social fitness. Much like social networking in general, you can communicate with fitness minded friends in order to gently encourage each other to get to the next level. This can be on either a one by one basis, or as a group of like i=minded people chasing a common goal. This in a nutshell is what an activity tracker does, and Jawbone own an impressive array of patents that protect what they do. The updated series of activity trackers that are currently hitting the market have all benefited from more intelligent data analysis. The challenge for activity trackers is to effectively differentiate between different types of movement in order to actually infer what you are doing. Thats four pretty different intensity levels of walking, ranging from the very steady 6km going downhill, right the way through to a challenging hike up a fairly steep hill. I question how bigger difference would be made in my hand movements between some of those scenarios, yet the calories expended will be markedly different (calories per minute, dictated by HR). This is a wider point, and is not limited to the Jawbone UP 2013 – it relates to all activity trackers. All of the leading manufacturers are naturally very secretive about their algorithms and measuring methodology, so its hard to determine who is doing the best job here. I do find it hard to believe that any device measuring from your wrist is going to be hugely accurate though, especially for any activity like cycling, where your arms are almost totally inactive. Indeed, i would imagine that an activity tracker located on my arm might well give me more credit for typing out this article then for completing a gruelling uphill bike ride – but i may be doing this technology a major disservice here. Besides, sleep tracking and calorie measuring is not an exact science and Jawbone don’t try and claim otherwise. Sleep is such an important part of our overall health that any device that can help us in this regard should be welcomed. Lack of sleep diminishes your performance across all areas, including physical and mental performance. People in a poorly slept state are more likely to eat poorly and to crave sugary foods and to make generally poorer dietary choices. They are also more likely to have excess cortisol, a stress hormone, which makes you more likely to be overweight due to its fat blocking characteristics. So tracking your sleep quality, and making the changes necessary to improve it, is highly worthwhile. One of the things I like most like about Up, is the sleep tracking. It is interesting to track, and the data is nicely presented. I have noticed some very definite patterns around my sleep based on the day of the week. Some are really obvious – i sleep longer on Friday and Saturday nights because i am off work on Saturdays and Sundays. However, some are less obvious. I am a creature of habit and will often gravitate towards the same foods on the same nights. I like a steak on a Saturday night, i often eat in the pub on a Friday lunch and so on. I noticed that i slept particularly poorly on Tuesday nights, and an analysis of my diet alongside this data allowed me to fix the problem. For those who are interested, i often play squash on a Tuesday PM on top of my usual early AM gym session. I therefore get home later and hungrier, and often undo the good work of a double gym session with a double sized pizza. My UP enabled me to pinpoint how this dietary indiscretion was actually impacting my wider health. My attitude swung 360 degrees, from seeing it as an acceptable cheat meal to an unwarranted binge. I cut it out and the impact has been worthwhile. All of that said, sleep tracking is only really useful for very broad trends and it is largely inaccurate and therefore best for just taking a wider interest in. I don’t expect many would gain the upside that i did. One additional nice feature is the power-nap function. The UP attempts to measure your nap and to wake you up at the optimum moment, having had just enough sleep to give you a boost. I’m not generally a power-nap sort of person, but the occasional one after a nite on the tiles is in order and i found this a helpful tool to avoid oversleeping in the day and subsequently knocking yourself out of sync. The UP’s companion app acts as a fully fledged calorie counter, along the lines of standalone apps like myfitnesspal. This lets you take pictures of what you’ve eaten whilst adding data around portion size manually. The app features a barcode scanner to allow you to quickly upload supermarket foods, which makes calorie counting about as painless as its ever going to be.